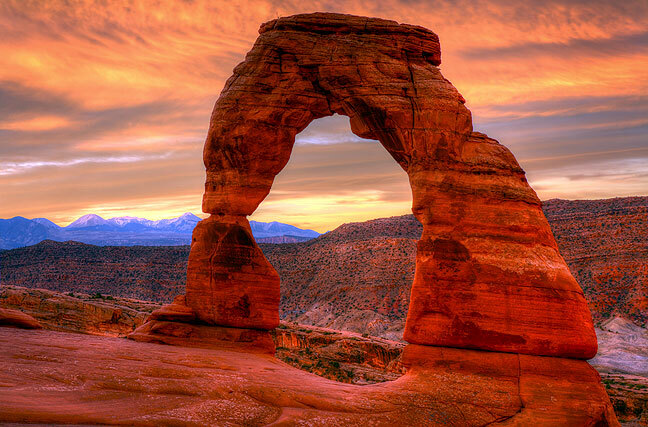 Delicate Arch in Arches National Park, Utah, an icon of the American southwest, where Abby and I got married in 2004, glows in pre-dawn light. Abby and I packed our Chihuahuas, Max and Sierra, and the rest of our travel gear in her truck and headed west toward our first destination, Santa Fe, New Mexico, on a trip to Moab, Utah, where we got married ten years ago. 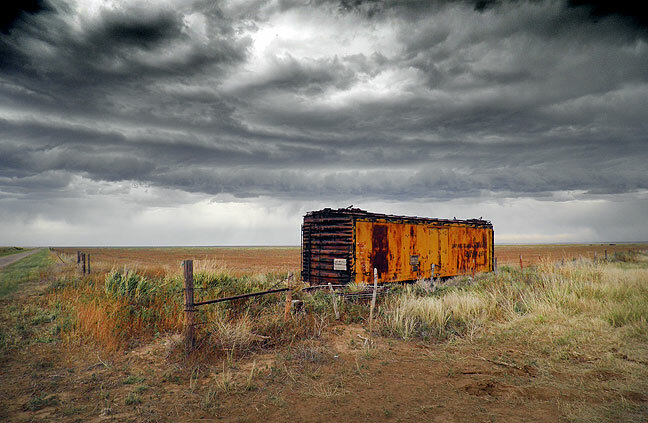 Storm clouds, rain, and high wind created a classic West Texas/Eastern New Mexico dust storm. This image was made after we drove through the heart of it. 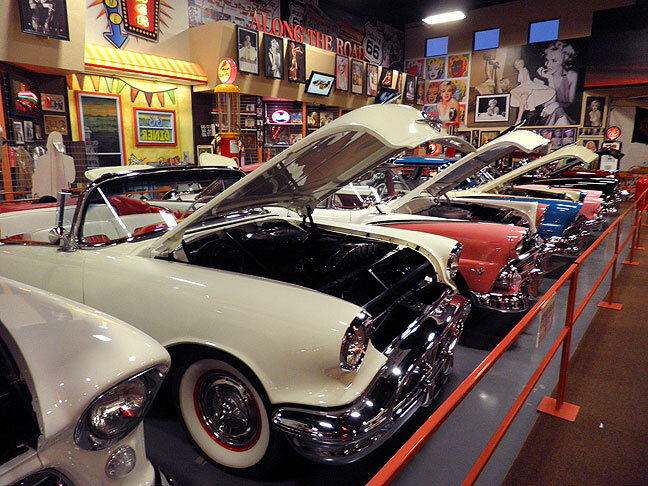 Russell’s Travel Plaza features this impressive free car museum. At the New Mexico border, we stopped at a travel plaza called Russell’s, which replaced a “Café Motel” ruin I photographed many years earlier. Russell’s included an extensive gift shop, where Abby found and bought a new hat and hoodie, which she ended up liking so much she wore both for the rest of the trip. Russell’s also included a surprisingly large free car museum. As we rejoined I-40 westbound, we were greeted by rain and a powerful windstorm, which generated several dust storms that resembled haboobs. At one point, we were forced to slow to about 35mph and turn on our hazard flashers. 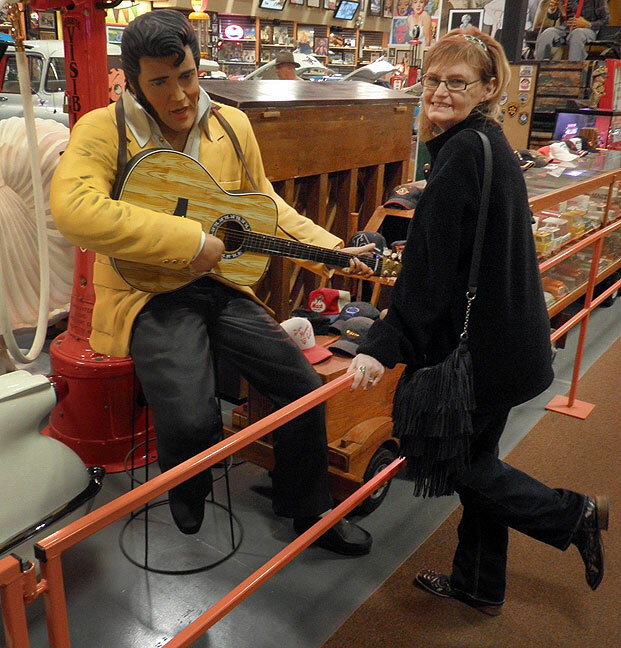 Abby flirts with a life-sized Elvis Presley figure at the free car museum at Russell’s Travel Plaza in Endee, New Mexico. Abby leans out of her window to make pictures of the stormy eastern New Mexico weather. 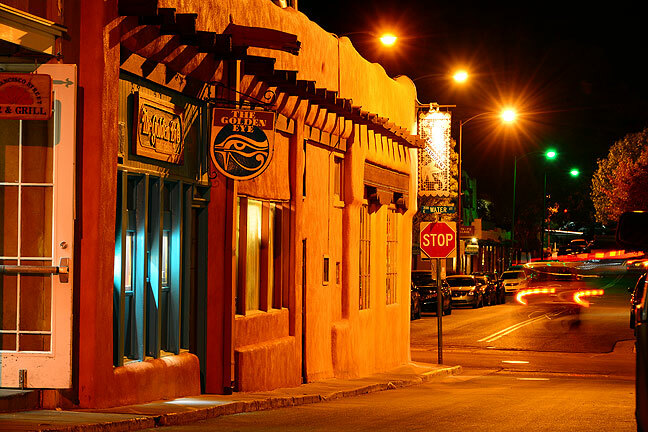 We rolled into Santa Fe well after dark. 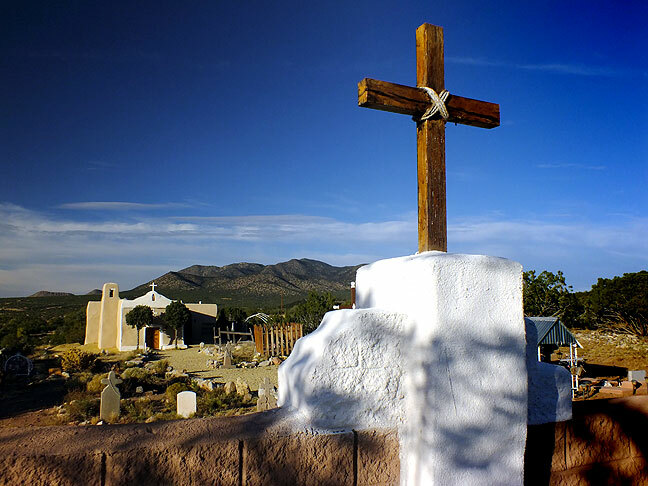 Crosses pick up high country sunlight at Taos Pueblo. 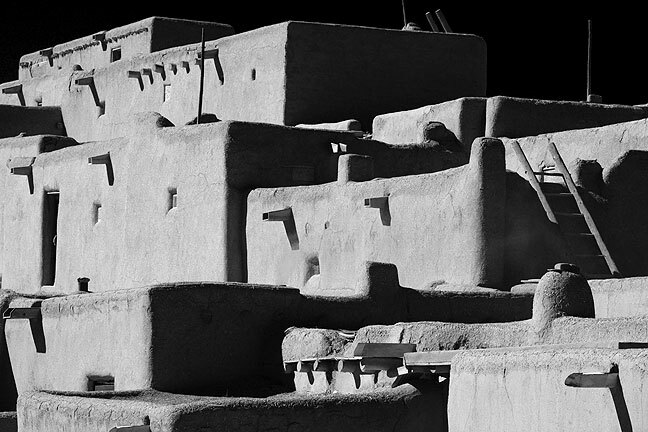 Taos Pueblo was first in my agenda. I recall that on my 1999 vacation, Villanueva, I was discouraged by the price of admission, $16, and the littered appearance of the entrance, but this time I felt it was worth a look, and I was glad. 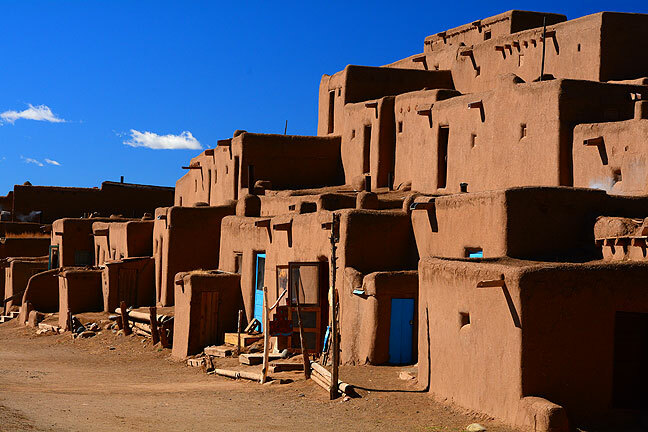 A UNESCO World Heritage Site, Taos Pueblo is northeast of Taos, New Mexico. Despite crowds of tourists and photographers like myself, the people of the Pueblo were friendly and eager to tell their stories. 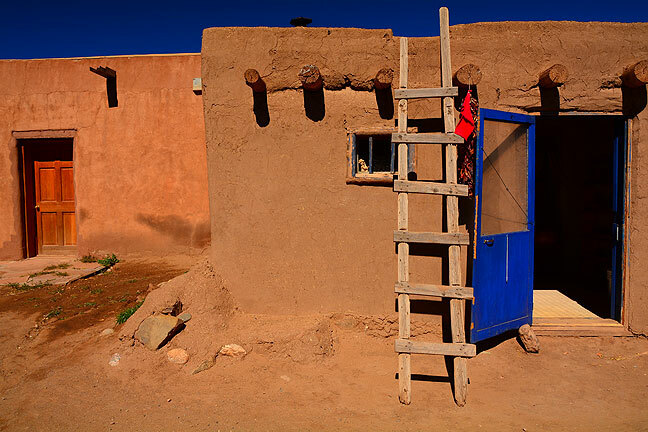 Ladders combine with adobe and wooden beam construction to form typical Puebloan architecture. 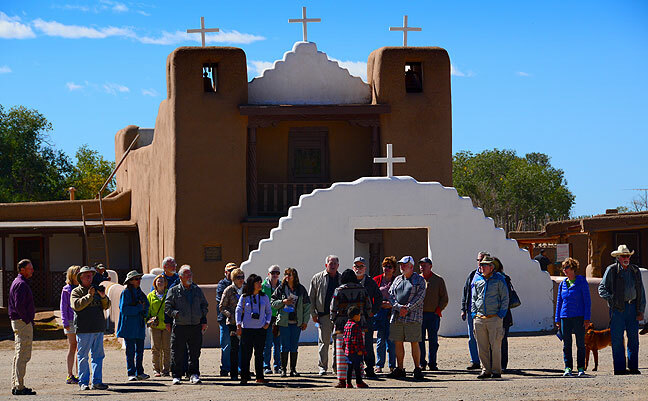 A tour group huddles around their guide outside the church at Taos Pueblo. Photography is not permitted inside the church, but exterior shots are perfectly fine. The only place you can go at Taos Pueblo that you aren’t allow to photograph is inside the Catholic Mission (Abby and I discovered this same policy 11 years ago at Acoma Pueblo), which has several boldface signs in the atrium warning that anyone taking photos risks having their equipment confiscated. The reasons for this policy are a bit nebulous to me, but I respect it. I bought and tried some fry bread after seeing two women emerge from a shop claiming it “just melts in your mouth.” Their assessment was correct, though I found that fry bread might be the least nutritious food I’ve ever consumed. 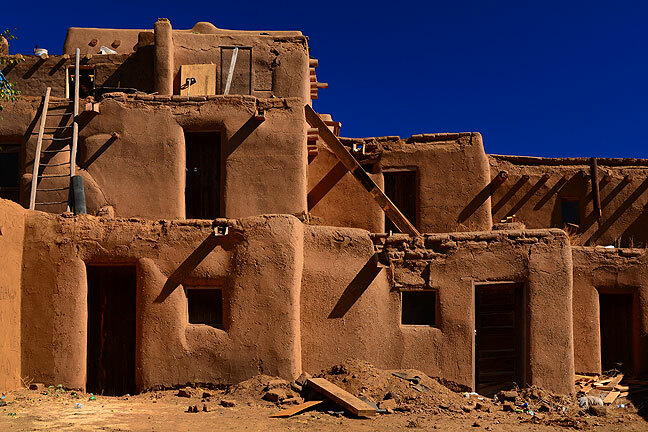 This image shows some of the classic multi-story architecture of Taos Pueblo. I saw some small, hand-carved birds on a vendor’s table. The vendor told me they were quail, a bird my wife hunted since she was a child, so I bought her one. 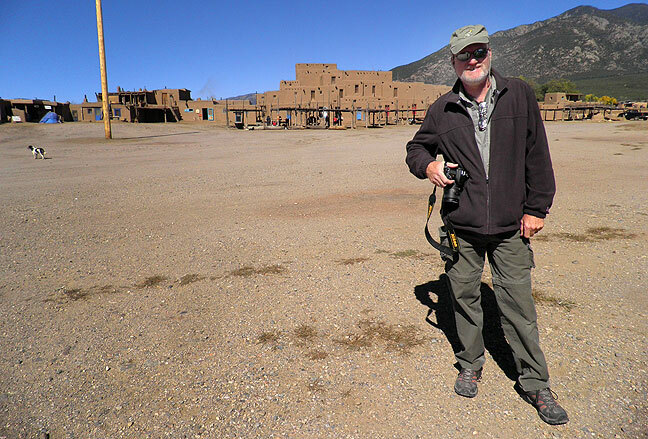 I handed a camera to someone who looked like he knew how to handle one and asked him to make this picture of me at Taos Pueblo. 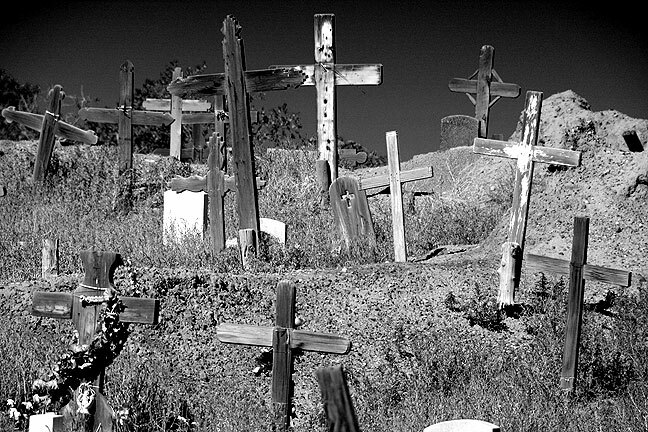 Crosses fill the cemetery at Taos Pueblo. I thought it odd that no one is allowed to photograph the inside of the church, but the cemetery is fair game. 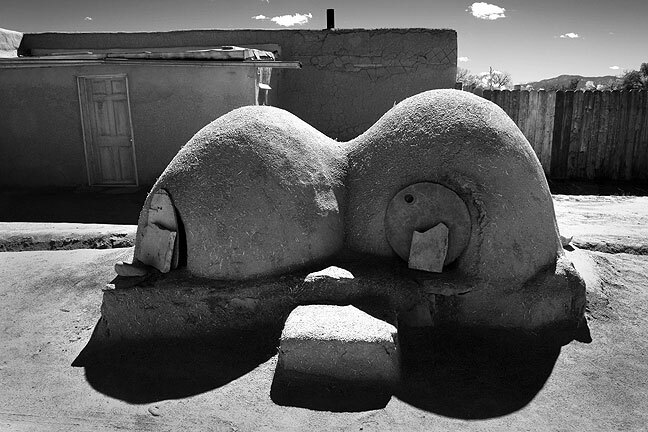 A double kiln stands in bright midday sunshine at Taos Pueblo. 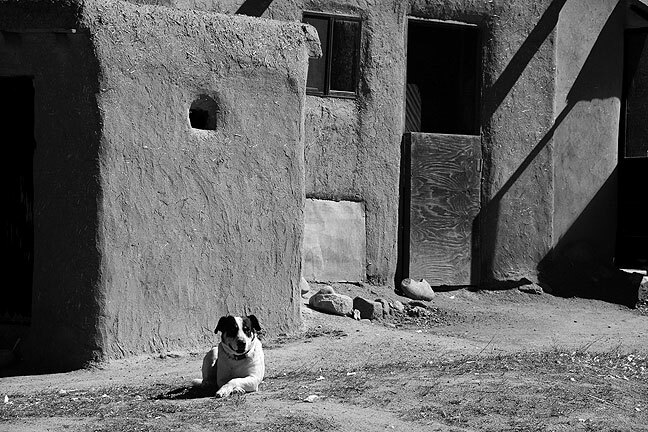 Dogs like this one were a common sight throughout Taos Pueblo. 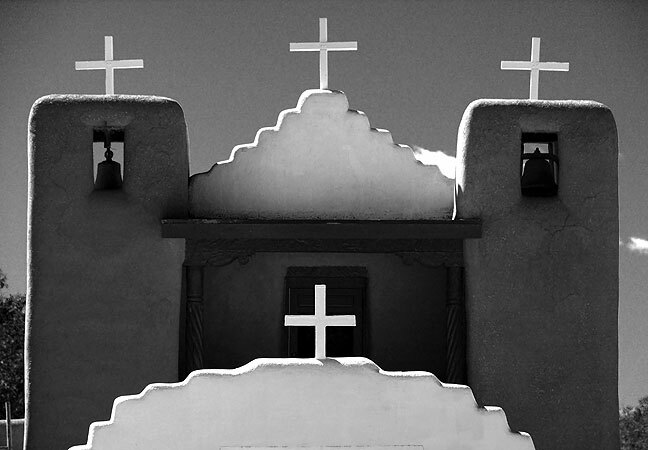 The high desert light of Taos Pueblo creates a scene of striking contrast, like these crosses on the church set against a clear sky. 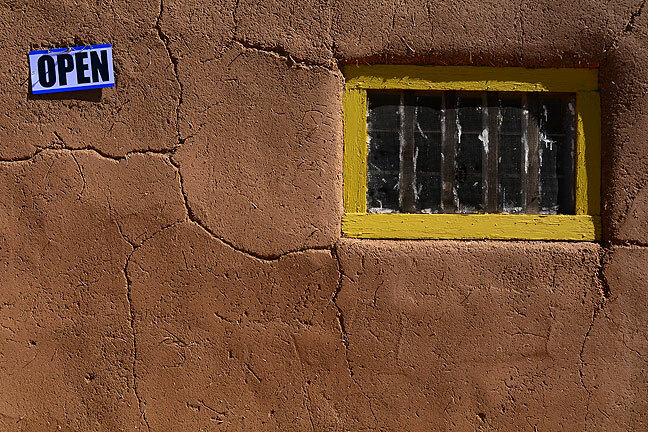 …a color rendition of the Pueblo brings out more texture. 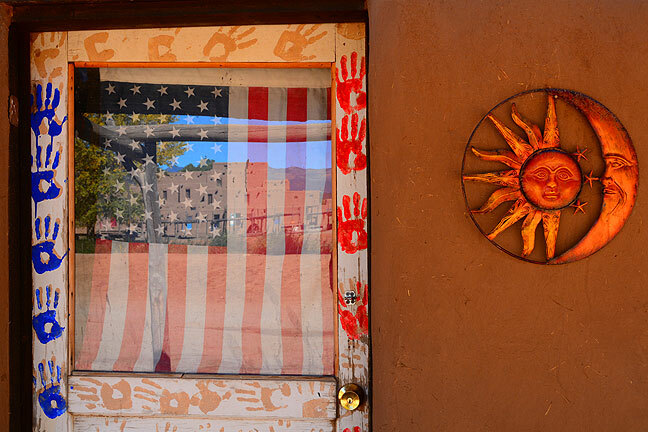 Almost all of the areas open to the public at Taos Pueblo contained businesses like this one. 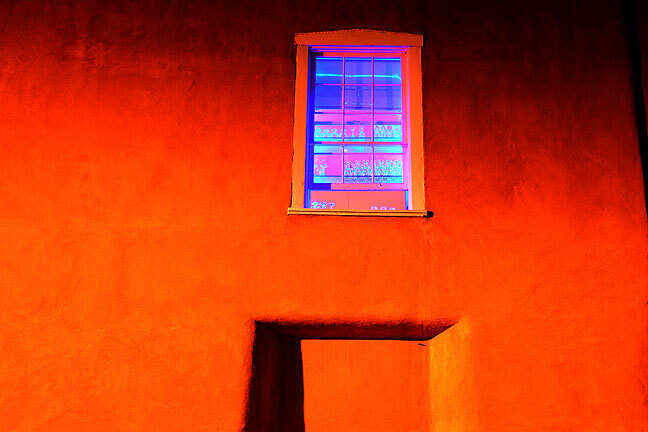 This store front at Taos Pueblo shows off the location’s color and character. 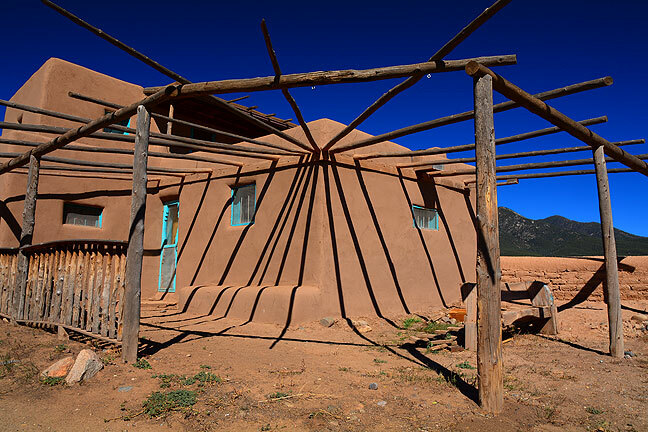 The northeast corner of Taos Pueblo features this structure with fascinating shadows. 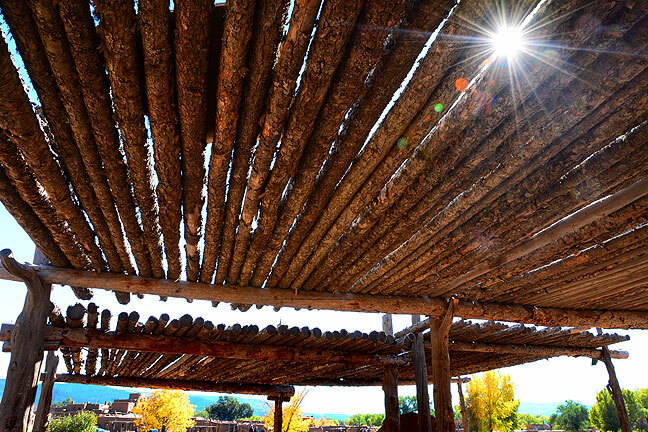 Used for shade in the center of the plaza of Taos Pueblo, these wooden structures gave me an opportunity to express the brightness and clarity of the day. 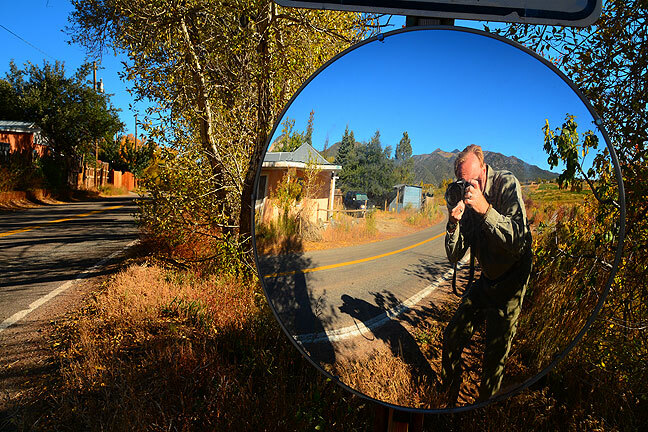 I made this self-portrait in a blind corner mirror on the highway in Arroyo Seco, New Mexico. 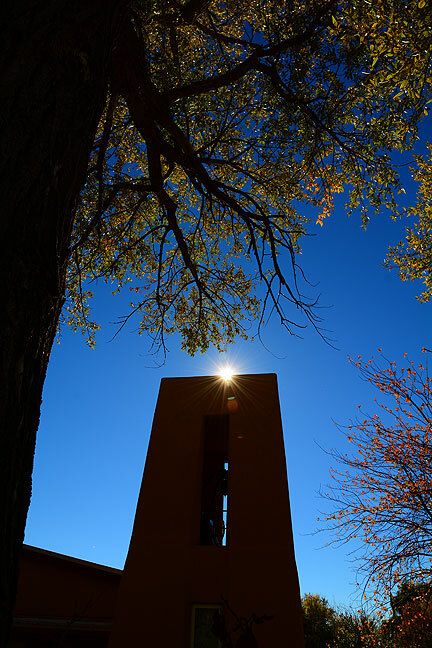 Just steps away from the mirror I photographed in Arroyo Seco, I spotted the afternoon sun peeking over this church. I drove farther north to the Taos Ski Valley. At 9200 feet, the air was clear and cool, which reminded me of many years of skiing in the area, including at Taos and nearby Angel Fire. 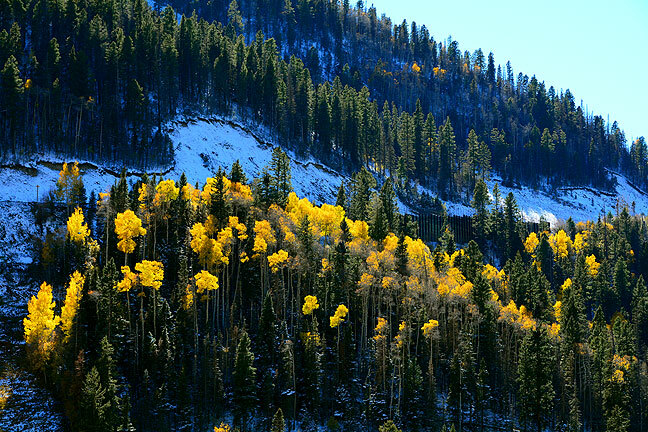 The aspens were turning deep yellow in the midst of pine, and made several excellent images. I also scoped out a trail head for a future trip to hike Wheeler Peak, the highest point in New Mexico. Delicately illuminated aspens curve against dark pines near the Taos Ski Valley entrance. 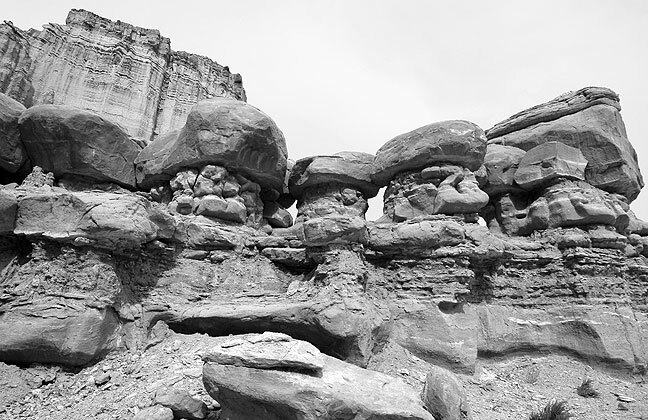 Abby and I drove up the Aneth Highway in the Four Corners region of Utah. I was hoping it would make picture, but this was the only image I got out of it, of Abby’s truck. 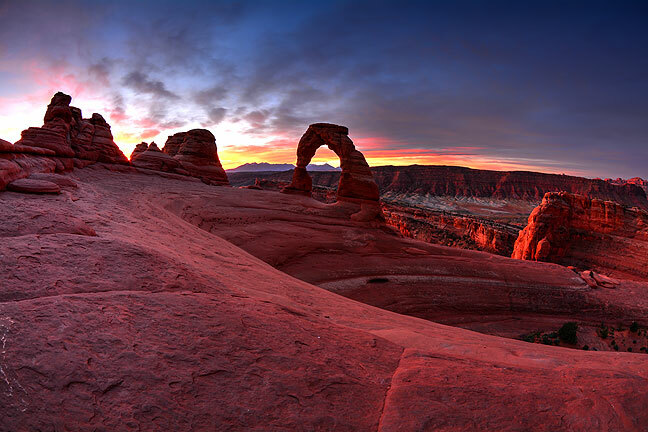 I have photographed Delicate Arch in Arches National Park, Utah, many times and in many varied lighting conditions, but never at sunrise. 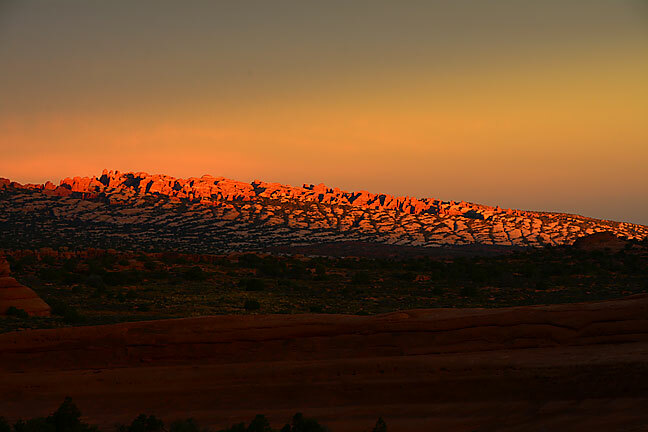 When we rolled into Moab the night before and I told Abby and I wanted to be on the trail before sunrise, and that it would be about 40ºF, she wished me well and told me she and the dogs would sleep in. 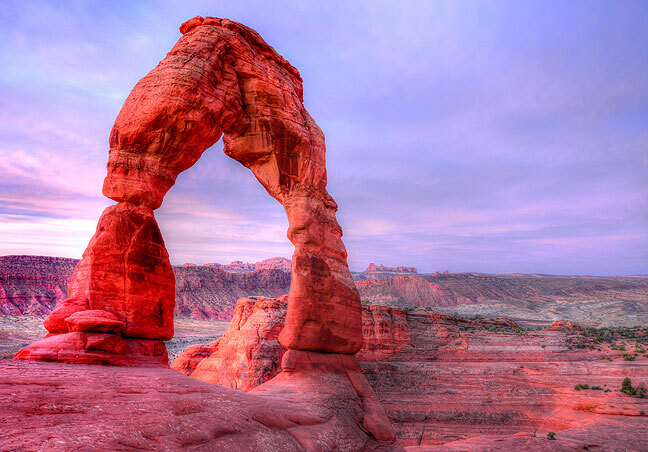 Delicate Arch in Arches National Park; this shoot was my best so far at this feature. 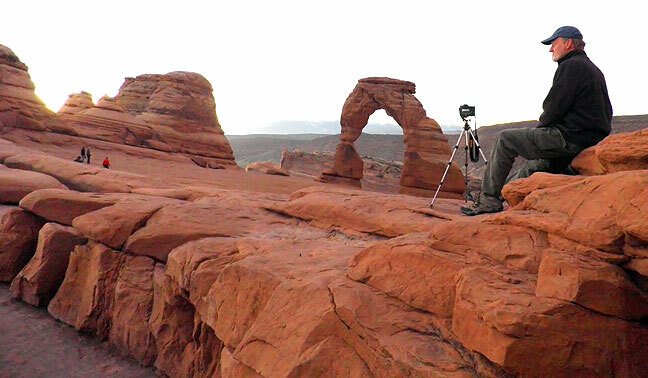 A friendly fellow hiker made this image of me photographing Delicate Arch before sunrise. 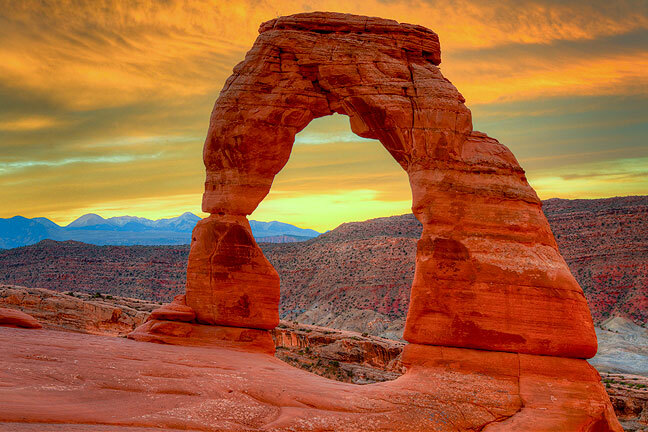 Delicate Arch stands as an icon of the Southwest, an enduring image of the beauty of nature, and, for Abby and me, a symbol of the vows we took the day we were married there ten years earlier. A fellow traveller used my camera to make this image of me greeting a chipmunk as the light matured after sunrise at Delicate Arch. I arrived at the trail head about 90 minutes before the official sunrise time of 7:25, and was a little surprised to find I was alone. 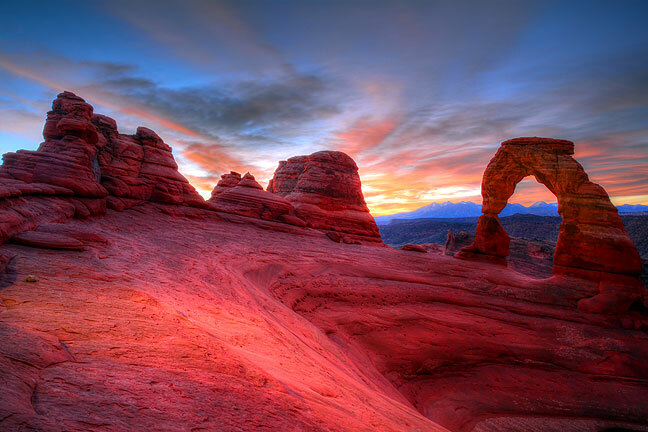 In addition to sunrise, this would be my first time at Delicate Arch by myself. I blasted up the trail at my usual impatient pace. Their was a waning half moon, so I only needed the red beam from my headlamp, which preserved my night vision well. As I rounded the last few corners of the trail, I saw the sky start to take on color, so I muttered to myself, “Push, push, push, push,” and halfway ran the rest of the way to catch the light. It was a good call, since I was able to started shooting right away, and I feel like I made some of my best Delicate Arch images so far. I had several flashlights with me on my Delicate Arch hike, and used one to enhance the illumination in this image. At one point, a chipmunk approached me, hoping for a handout. It was so tame it actually stood on my shoe and tasted my hand before scurrying off. 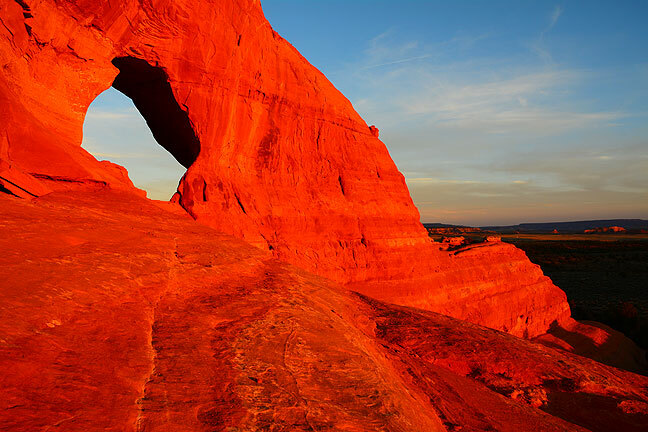 These fins to the northwest of the Delicate Arch area caught the first light of sunrise. 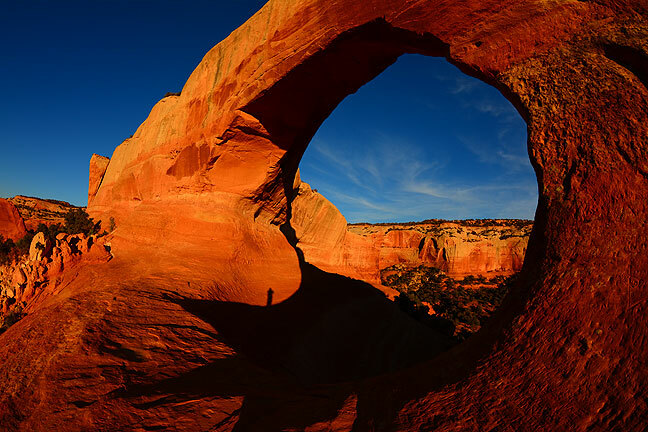 This view looks southwest toward Delicate Arch from the formation across the canyon. Its exploration turned our to be a great idea. 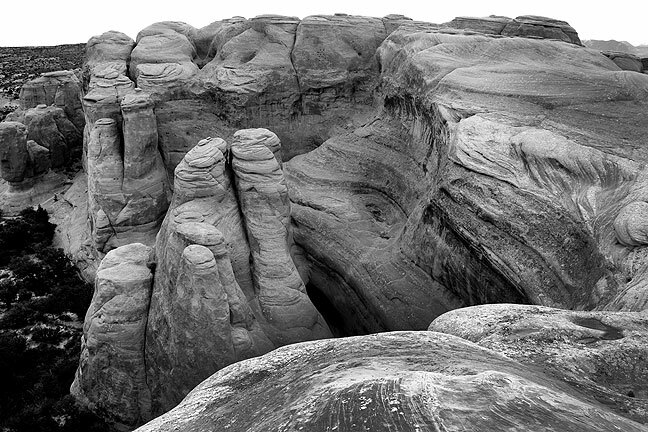 On the Arches National Park map of the area, I noted a very interesting outcropping of formations just north of the immediate Delicate Arch area, which I saw and photographed many times, but never explored, so I vowed to check them out this time. It was an easy jaunt, with some fun up and down moves, and a little bit of route-finding. 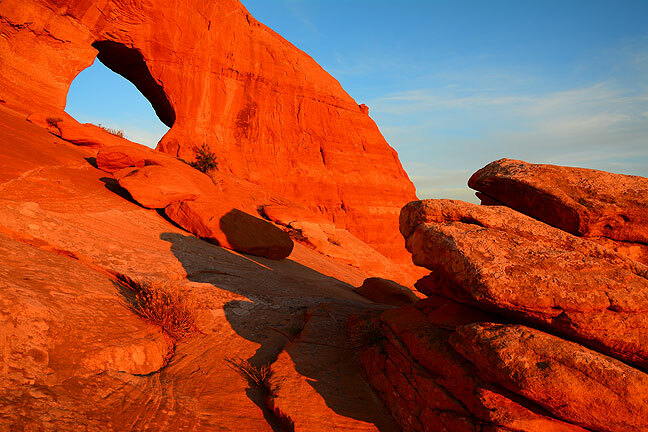 There is a largish natural arch in the midst of it which, according to the kiosk at the visitor center, is called Echo Arch. 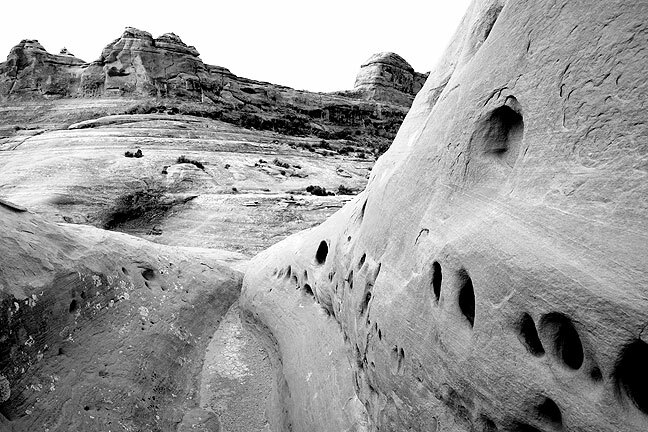 The formations surrounding Echo Arch were all of a similar hue, and seemed better expressed in black-and-white. 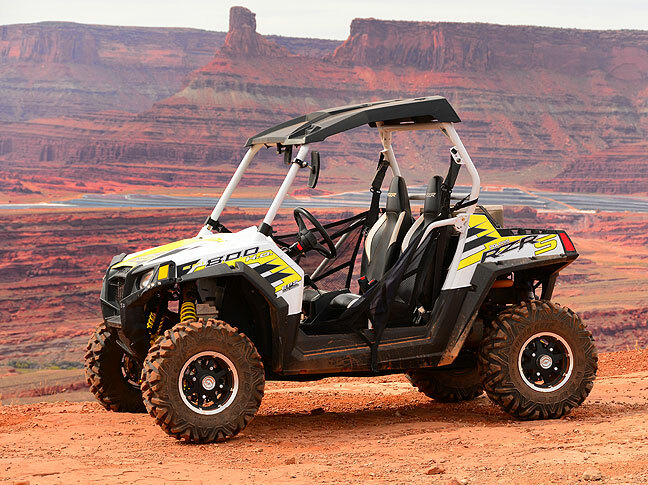 The Polaris Razor was the dominant off-road vehicle on the Hurrah Pass road. 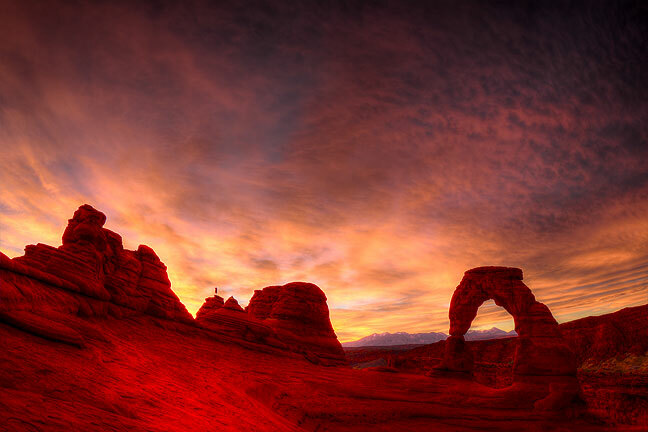 I have seen Delicate Arch in many different lighting conditions, but none compared to the vast variety of this sunrise visit. 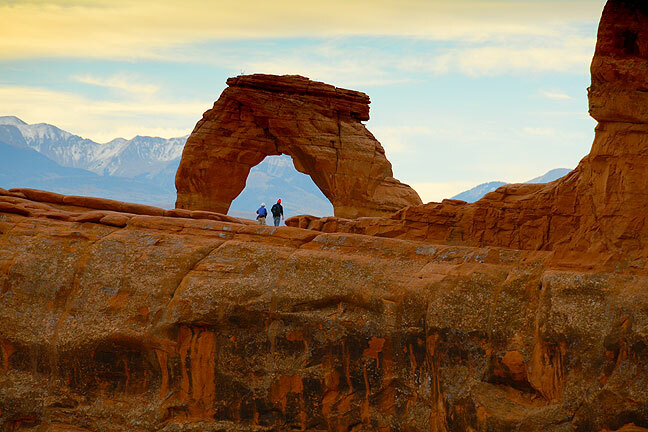 A tiny, solitary figure appears silhouetted in the center left portion of this frame of Delicate Arch; it is a fellow hiker, making pictures. 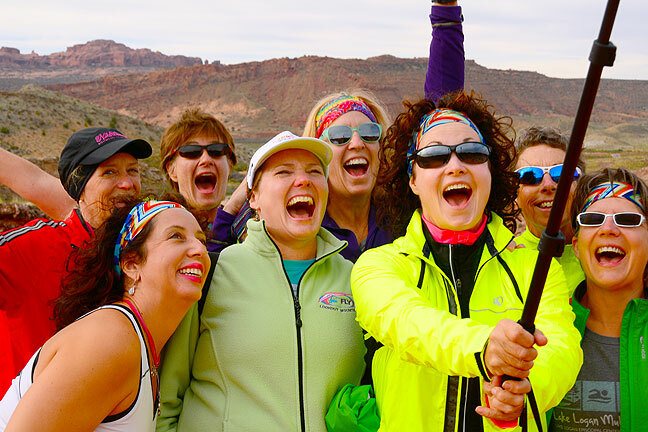 I saw this fun-looking group making an action cam selfie on my way down the Delicate Arch trail. 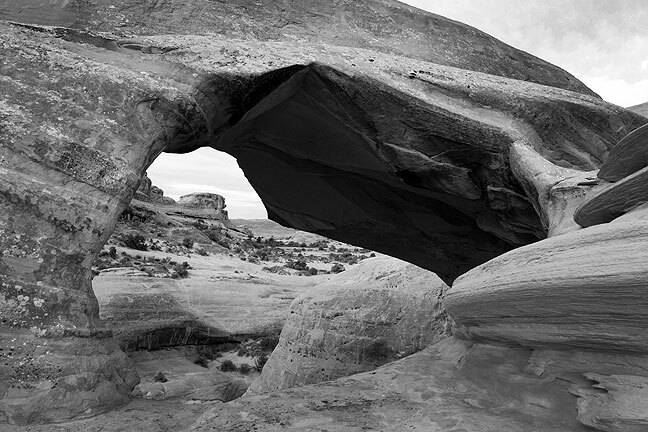 Echo Arch, across a small canyon from Delicate Arch, is difficult to photograph because it is hard to find a position from which you can see daylight through the opening. I had to lie down to get this frame. The Echo Arch area was fun and easy to explore. Although I have been hiking in the area since 2002, this was my first time to check it out. 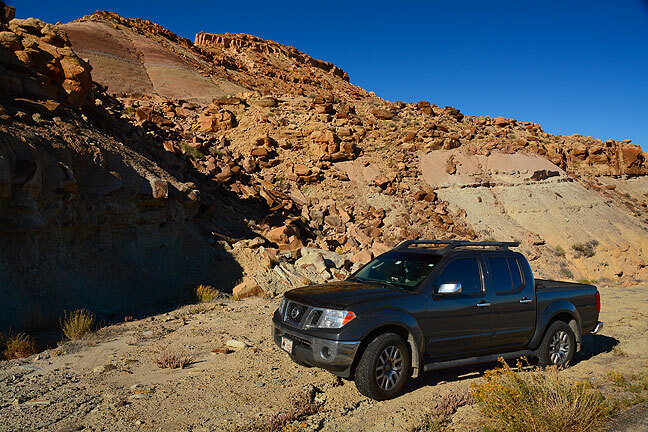 Mudstones of the Hurrah Pass region form interesting cliffs. I ventured up a short pouroff on the on the Hurrah Pass road to find this deep, leading image of a short slot. 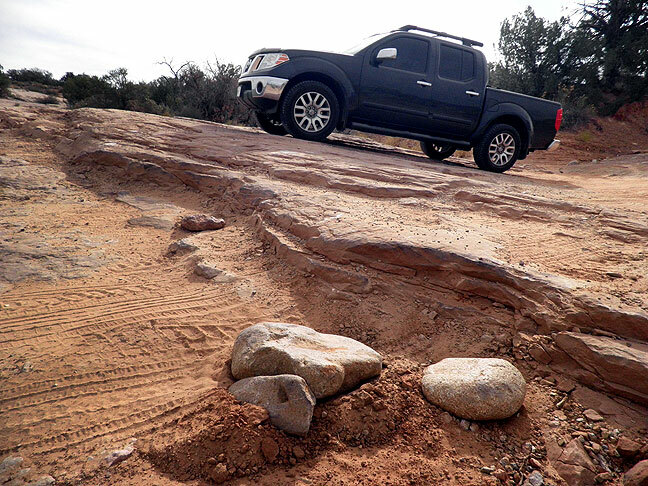 Abby’s truck performed well on any of the four-wheel-drive roads I encountered. 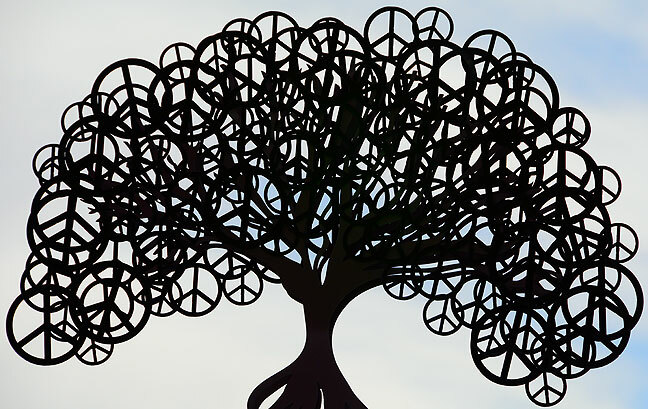 I spotted this metal sculpture, a tree made of peace signs, at The Peace Tree café in Moab, Utah, while I was shopping for a gift for Abby. 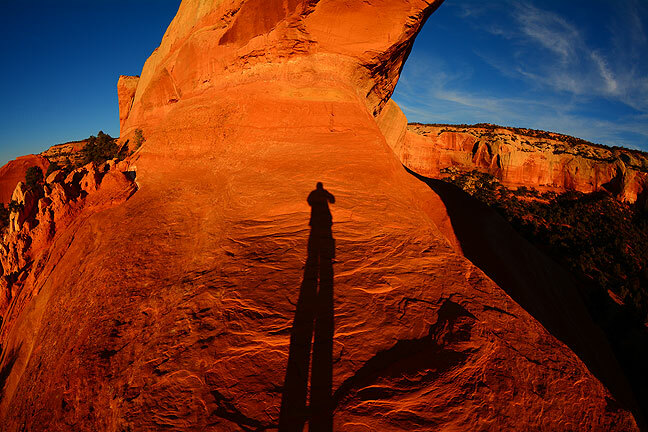 Standing in Wilson Arch facing east, I saw my long shadow and made it into a self portrait. 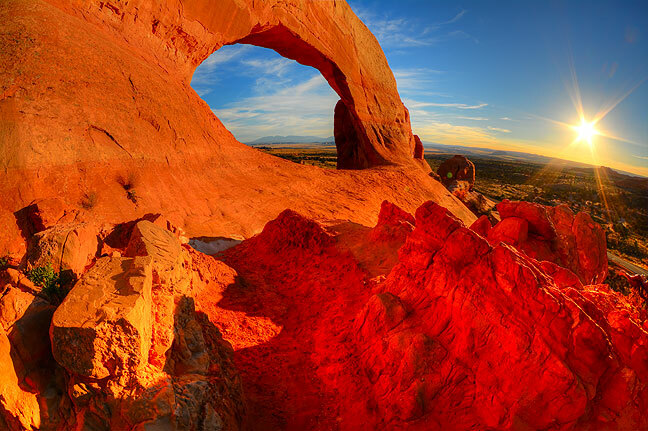 Deep afternoon color dominates this image of Wilson Arch south of Moab, Utah. Looking Glass Rock takes on a deep red hue as the last minute or so of sunlight strikes it at sunset. The sign at Hurrah Pass; the road wasn’t all that difficult, but it was rough and required four-wheel-drive in a few spots, which was no trouble at all for Abby’s Nissan Frontier. 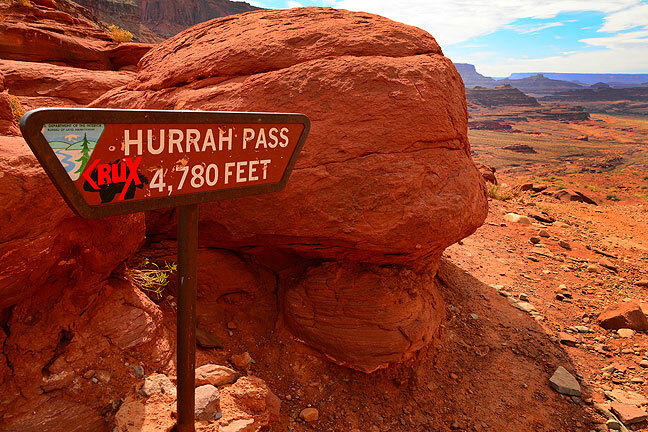 Hurrah Pass is particularly significant because Abby and I have looked down on it from the Anticline Overlook on Hatch Point several times (most recently in 2009) and vowed to one day drive on it. Late afternoon sun turns Wilson Arch a deep orange in this three-frame hand-held high dynamic range (HDR) image. 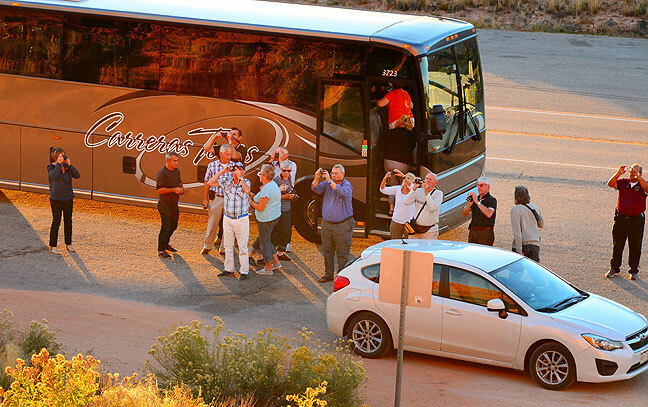 Nothing says “I’m done here” for me like the arrival of a bus full of tourists, like these at Wilson Arch. I wanted to shoot something at sunset, so I headed south and ended up at Wilson Arch, an easy to visit but beautiful feature along U.S. 191 south of Moab. I made nice late-afternoon images of it until a tour bus disgorged a number of iPhone photographers, when I bailed. With a few more minutes of light left, I raced across to nearby Looking Glass Rock (which I last photographed in 2005), where I made it in time to shoot about three minutes of golden moment light, which was enough. The results were very satisfying. Looking Glass Rock is just a couple of miles from Wilson Arch. I made it to this feature with less than five minutes of sunlight remaining. 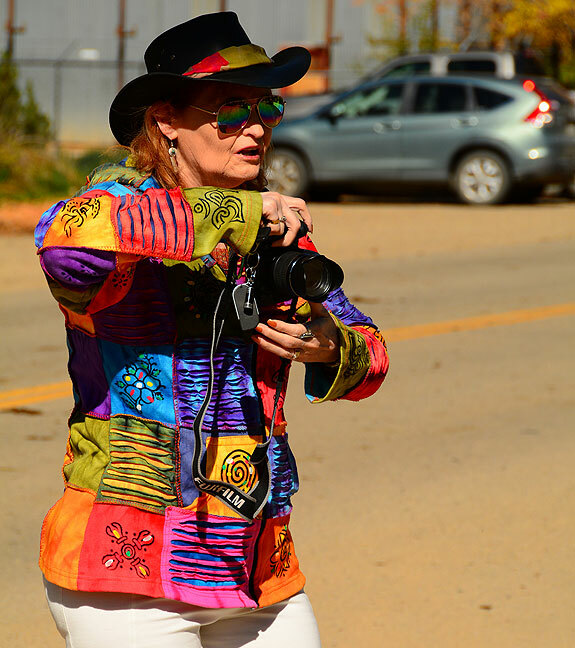 Abby takes aim at the cattle drive we spotted going through downtown Mancos, Colorado. Abby and I chose a more northern route, through Durango and Pegosa Springs, from Moab to Santa Fe. Along the way, I spotted a cattle drive making its way down the middle of the highway in Mancos, Colorado. Abby was asleep, but I quickly woke her, and we both leapt out of the truck to chase it down to photograph it. The leader was a young blonde woman in a red cowboy hat. The cowboys made the classic whistles and yips like in the movies. 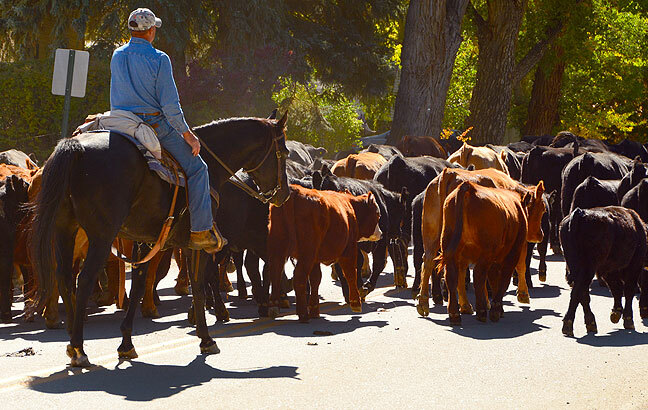 Cowboys guide their herd through the streets of Mancos, Colorado. And yes, the streets were covered in waste afterwards. Farther along, south of Pagosa Springs near Chromo, Colorado, I spotted some nice aspens and cottonwoods turning yellow in the clear autumn light. The spot was quite close to a similar shoot Abby and I made on our first anniversary trip in 2005. 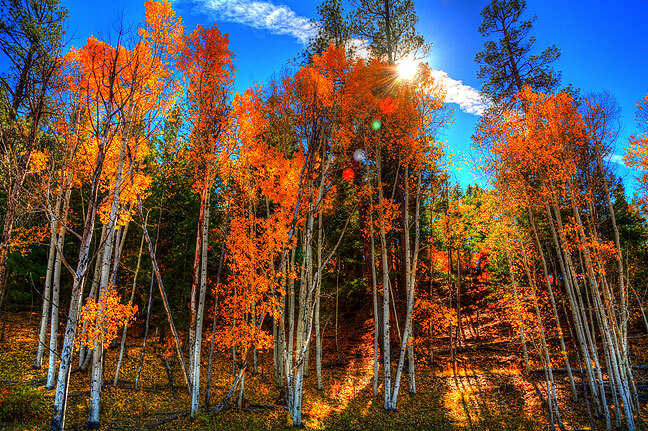 Aspens and high country sky shine is this three-frame hand-held HDR image made near Chromo, Colorado. 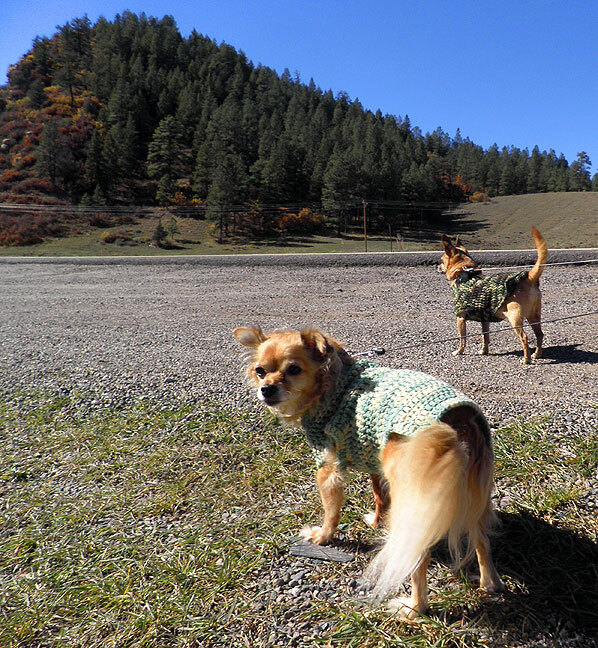 Our dogs, Sierra and Max, wearing Abby’s handmade sweaters, take a break to stretch their legs in southern Colorado. 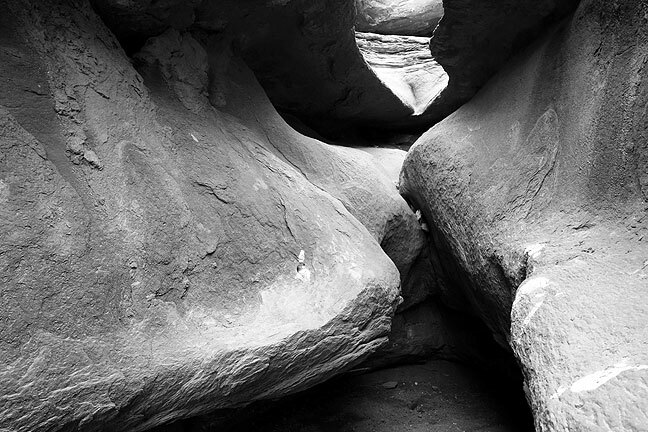 We made several more stops, but one of the most unusual was a feature in the Chama Valley called Echo Amphitheater. I don’t know how I missed it year after year, but I’m glad I finally spotted it. It was just us and a nice family from Austin, Texas, who I photographed with their cameras, and who photographed me with mine. The echoes in the amphitheater were like the echoes you hear in the movies. 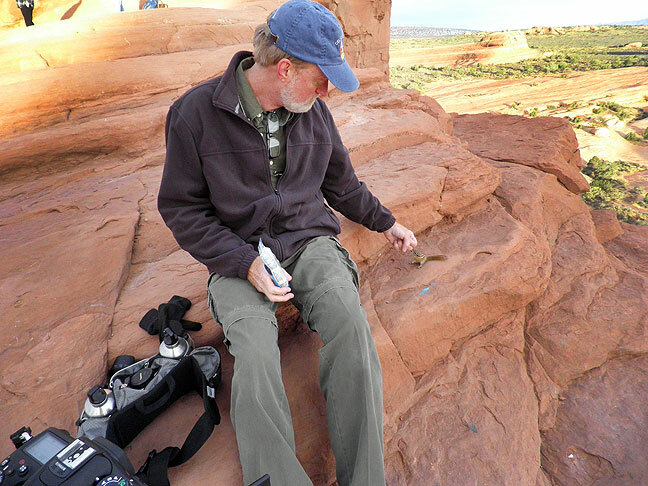 Desert varnish decorates Echo Amphitheater in New Mexico’s Chama Valley. The name was appropriate, as echoes were quite loud and distinct. 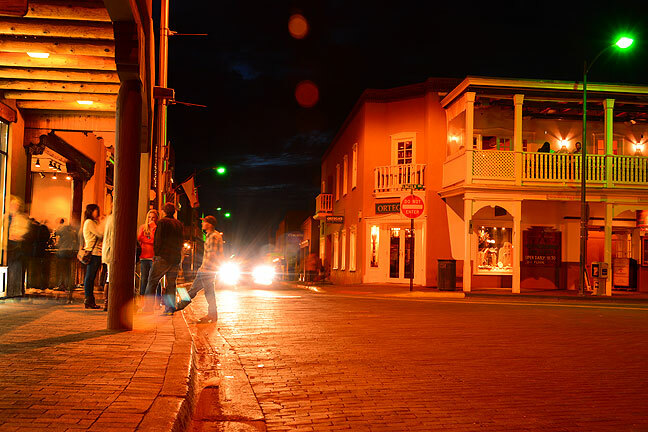 The more I visit, the more Santa Fe’s Plaza reminds me of New Orleans’ French Quarter. 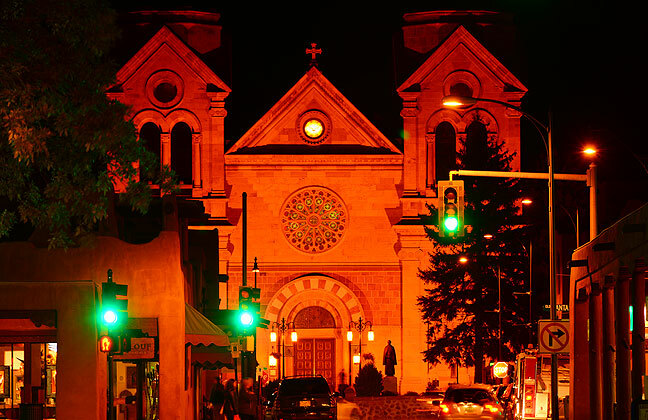 I decided to photograph Santa Fe’s historic Plaza at night, and found the experience very satisfying. Despite the Friday crowds, it made pictures. I arrived before it was fully dark, so I had some nice deep blue skies to accentuate the dazzling lights of the attractions. I was at The Plaza in time for the last evening sky, which gave a more complex and satisfying pallet. …the Cathedral photographed about 45 minutes later with a black sky. 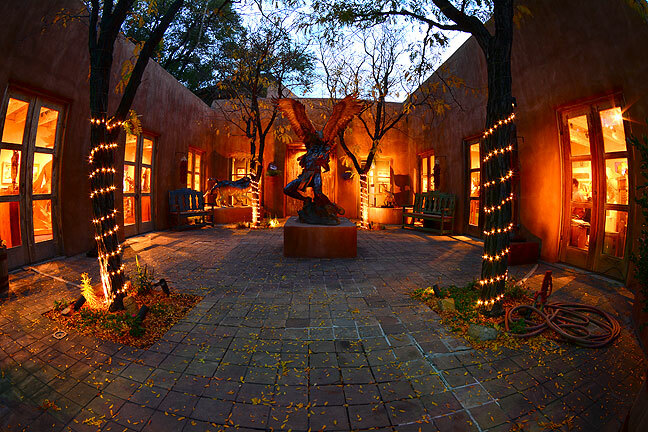 I sneaked into the gates of this business at closing time to make this image on The Plaza at Santa Fe. 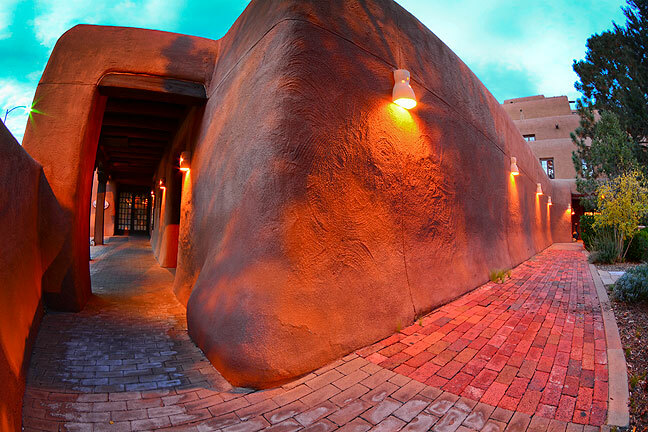 Adobe shops on The Plaza seemed particularly organic, like this one shot just after sunset. A monument stands at the center of The Plaza, but surprisingly, was not lit. 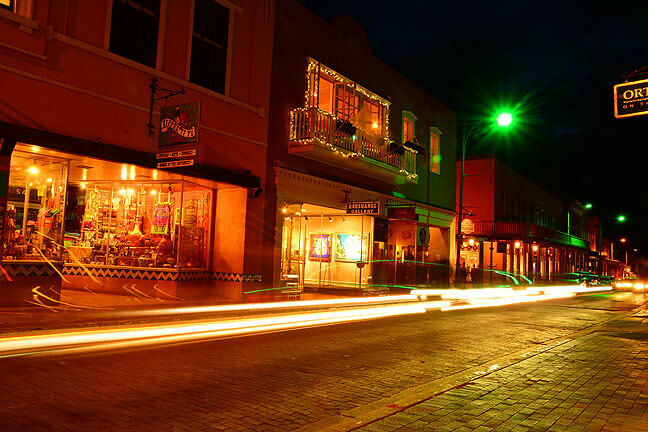 It is comforting, somehow, to see that people still get out at night, as in this Santa Fe Plaza image. As the years go by and visit The Plaza more, I become more familiar with it. I’ve tried to shoot this window many times, but didn’t like any of my attempts until now. 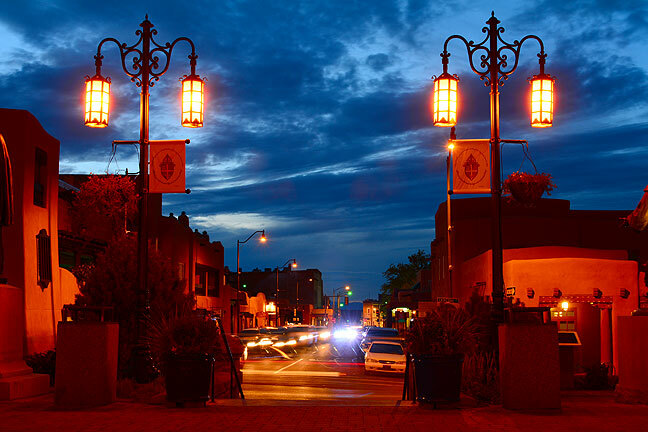 I knew the minute I suggested it to Abby that photographing The Plaza at night would be fruitful. A nice couple from California was the first among many to admire our Chihuahuas Max and Sierra. The next morning Abby and I returned to The Plaza with the dogs, who wore Abby’s handmade sweaters. Max and Sierra are always popular, but with a festive Saturday morning crowd, it was pretty amazing. There must have been at least 20 people who commented or admire them, some of whom wanted to pet them. The dogs seemed to do just fine with the attention lavished upon them. Also popular were Abby’s cowboy boots, which looked very Santa Fe-esque, but which she bought at our home in Oklahoma. 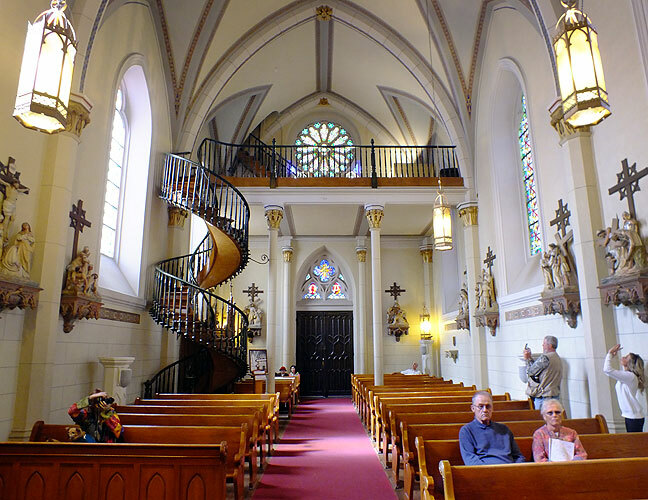 Another item on our to-do list was Loretto Chapel, home to a famous spiral staircase. The dogs were welcome as long as they were leashed. A popular wedding spot, Robert‘s sister Deb (who hiked with us in 2011) was married there. When planning our visit, we discovered a made-for-television movie about it called The Staircase, which we ordered for $3 on Amazon.com. The movie was waiting for us when we got home. 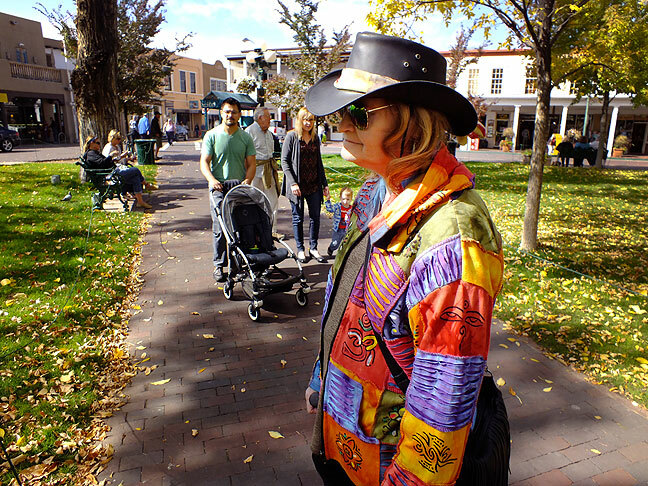 Abby chats with a visitor on The Plaza at Santa Fe. 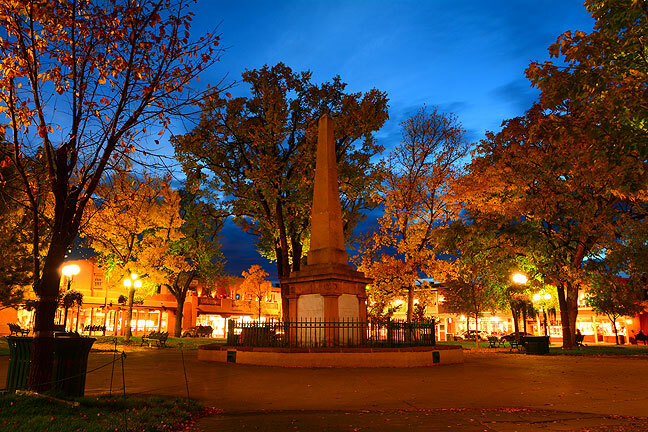 One of our checklist items for the Santa Fe Plaza was Loretto Chapel, home of the spectacularly engineered (though not “miraculous” as it is claimed) spiral staircase, seen on the left side of the frame. 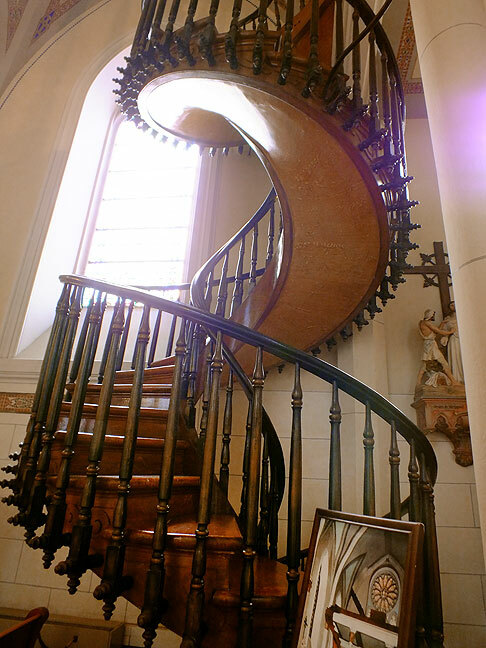 These are the stairs at Loretto Chapel, make without a central pillar or any nails. 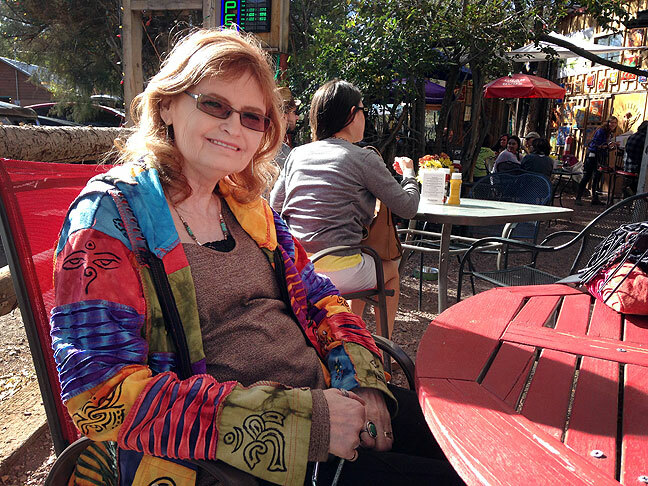 Abby smiles at an outdoor café, The Hollar, in Madrid, New Mexico. “I could live here,” she said. We had lunch outdoors at a place called The Hollar, which included free bowls of water for our dogs (and plenty of other people’s dogs), and a dog menu. Abby had fried okra and sweet potato fries, and I had one of the best chili rellenos I’ve ever enjoyed, stuffed with plenty of green chiles. 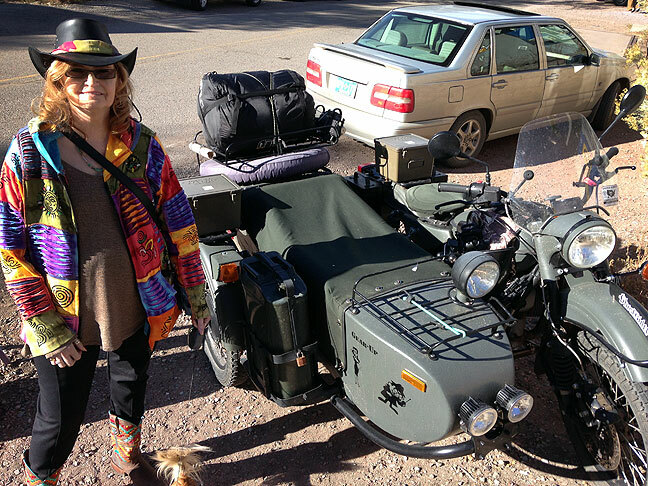 Abby poses by a Russian military motorcycle with a sidecar in Madrid, New Mexico. 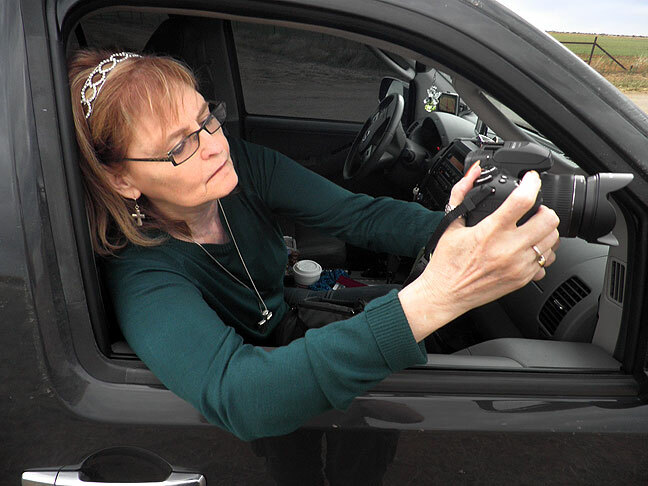 She talked with the owner for a while, who said he takes it to hunt, travel on four-wheel-drive roads, and even took it to the bottom of the Grand Canyon. 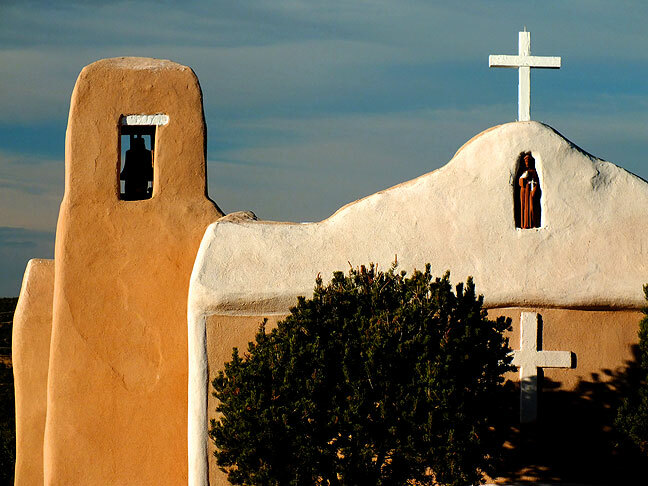 South of Madrid about ten miles in Golden, New Mexico, I spotted a small, meticulously preserved and/or restored Catholic mission called the San Francisco de Asis Church. Another couple and I were photographing it from outside the gate when a man approached and said he’d let us in to take pictures if we would put something in the donation kiosk. It was a lovely spot in wonderful afternoon light. 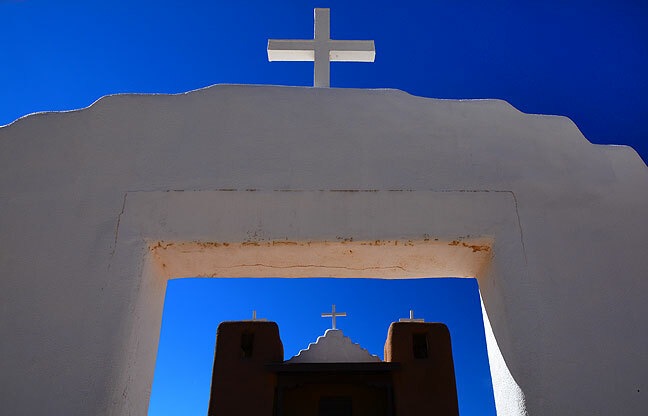 The San Francisco de Asis Church of Golden, New Mexico was immaculately maintained. 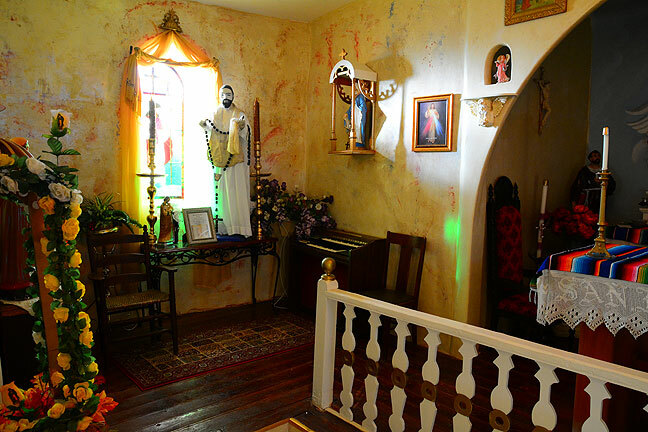 The interior of the San Francisco de Asis Church was as beautiful as the exterior. 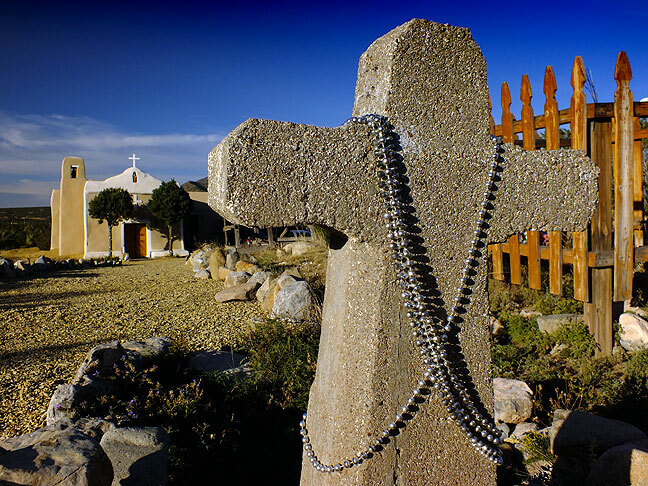 There was a small graveyard in front of the San Francisco de Asis Church. 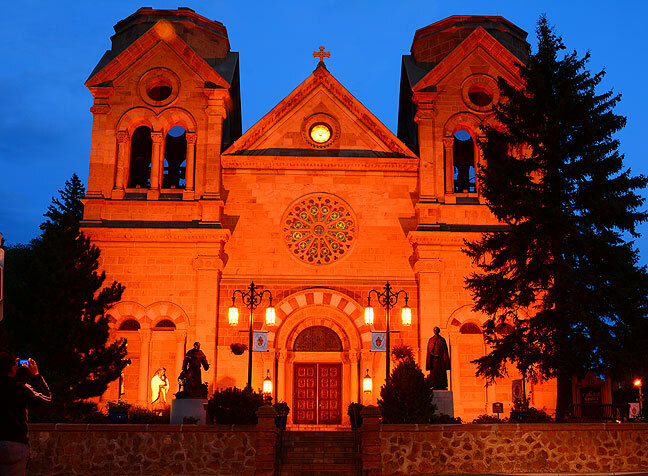 Golden, New Mexico’s San Francisco de Asis Church shines in high country sunshine. Looks like a great trip. The arches are incredibly lit. Sorry we were not able to have dinner this trip. The “kilns” are called “ornos” and are used for baking bread. A fire is lit and burned inside the oven. It is swept out after it is hot and then the bread bakes. Like your marriage thoughtful and beautiful. Wonderful images, many of them frame-worthy. The pastel skies and threatening clouds are excellent juxtapostions concerning this region of America. Great job. One word: wonderful. I hope to one day be as lucky as you. Some of my favorite arch photos yet! The multicolor sunrise is spectacular. One day (shaking fist) I vow to join you. All the images are wonderful, as expected, and some are downright inspiring. Though I find it odd (for me) to say this, I think my favorite was of the group of women making a photo of themselves. There’s an abundance of joy and life in that one photo, as if they’ve just accomplished something or are remembering something wonderful. New Mexico is a pretty big state and there are plenty of things left for me to explore. Wheeler Peak is on that list. I have been almost there on a number of occasions starting as far back as 1981, but I have yet to high point it. Maybe next summer. Interested? love your photos! looks like all four of you had a great time. makes me want to go hiking in New Mexico! Some mighty strong images there, my friend! 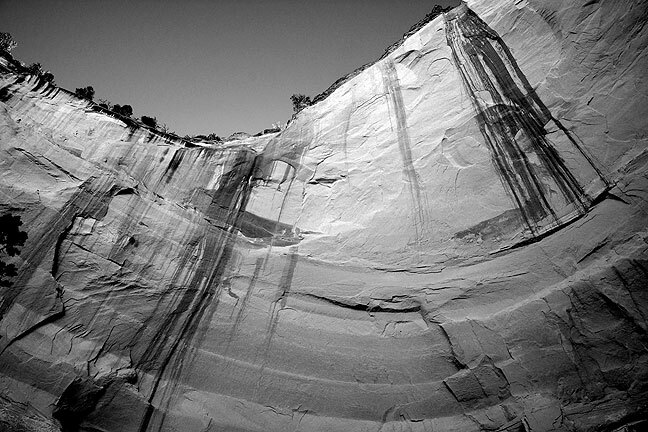 The shots of the canyons and the pueblos have that delicate reverence to them I’ve come to expect from you, and I really enjoyed the geometry of some of the compositions. That shot of the girls doing the selfie was indeed full of joy and excitement. Page One! These photos are very inspiring! Glad you had a great trip-happy anniversary–and thanks for sharing! Love it. Looks like a perfect 10 of a time!